Here's why shares of the nation's third largest bank by assets headed higher today. It's a good day to own bank stocks. The industry overall is up considerably in afternoon trading. With roughly an hour left in the trading session, the KBW Bank Index (INDEX: ^BKX), an index tracking 24 large banks, is up by 1.65%, with many of its components trading even higher. Turning in one of the best performances among banks today is Citigroup (NYSE:C), which is watching as its shares move higher by more than 2% higher at the time of writing. As I noted earlier today with Bank of America, most financial news outlets are attributing the surge to the bullish comments of a hedge fund manager who appeared this morning on CNBC. According to David Tepper of Appaloosa Management, "If the Fed doesn't taper back, we're going to get into this hyper-drive market. It's a backwards argument. To keep the markets going up at a steady pace the Fed has to taper back." In other words, at least in Tepper's opinion, the market is headed higher irrespective of whether or not the central bank pulls back on quantitative easing -- assuming, of course, that it does so in a restrained manner. While there's no question that the Fed is at least partially behind the ongoing bull market, when it comes to a bank like Citigroup, there's at least one additional variable at work: valuation. Like Bank of America, Citigroup's troubles during the financial crisis, and the bank's subsequent financial atonement, have driven down its multiple. 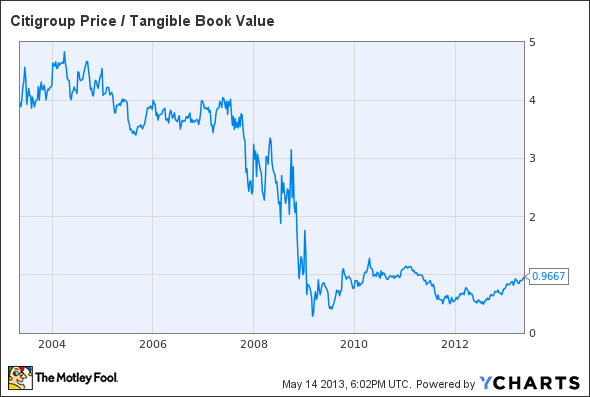 C Price / Tangible Book Value data by YCharts. As you can see in the chart above, prior to the financial crisis, it was trading for anywhere from three to four times tangible book value. Since then, however, it's regularly exchanged hands for less than one times tangible book. And this has been particularly notable since the middle to end of 2011, around which time its shares were being valued at roughly half of book value. The point is this: On days like today, when the market is generally higher, banks that are trading for a relative discount to their tangible book value stand a better chance of outperforming the sector. And that's precisely what we're seeing this afternoon with Citigroup.